Courtesy In A Crowded Lane | Mediterra - Swim & Run Better Than Ever! Here are some guidelines I’ve used to help me be a more courteous swimmer in a crowded lane and contribute to a more peaceful pool space. I very much want to just get in the water and do my thing. I don’t come to the pool to chat, and I really do not want to be disturbed once I get into my main practice sets. But even out of self interest, it is far better to come into the pool and first greet any familiar faces, and especially any people who appear new to the pool, and let them know you are a friend and ally in the water. Even at a turn at the wall, when noticing a familiar face entering the area, quickly wave a hand in greeting before pushing off into the next lap. That acknowledgement sends a signal of good will. Friendliness prevents many problems and it makes many of them easier to solve once an issue with another swimmer does come up. And, if you’ve already made a friendly connection to the other receptive swimmers in the pool, when a real grump does appear and cause problems, the friendly folk will likely support each other against that person’s unreasonable complaints. Being friendly helps create positive peer pressure so the group can guard courtesy together. Your first concern is safety. Your second concern is compatibility. Before getting in the water notice the width of the strokes of those sharing the lane with you and their consistency. If you see someone with really wide swings or not holding a straight line, or not able to stay to the side of the lane, beware when passing this person in either direction, or pick another lane. You risk striking opposing recovery arms and smacking heads. So be aware of heads and arm that might cross your path. And, notice which swimmers seem to be slower than you and which seem to be faster. Try to pick a lane where you may, on average, slip into the pace without blocking the swimmer coming up from behind you very often. It is very frustrating for swimmers on both ends of the spectrum – those who are slower than the others or faster than the others – to have person of dramatically different speed jump into the lane and disrupt the rhythm. No one likes being held up, and no one likes the feeling of holding others back when they did not choose to impose that. Check with the pool rules, but it is common that two swimmers will split the lane. 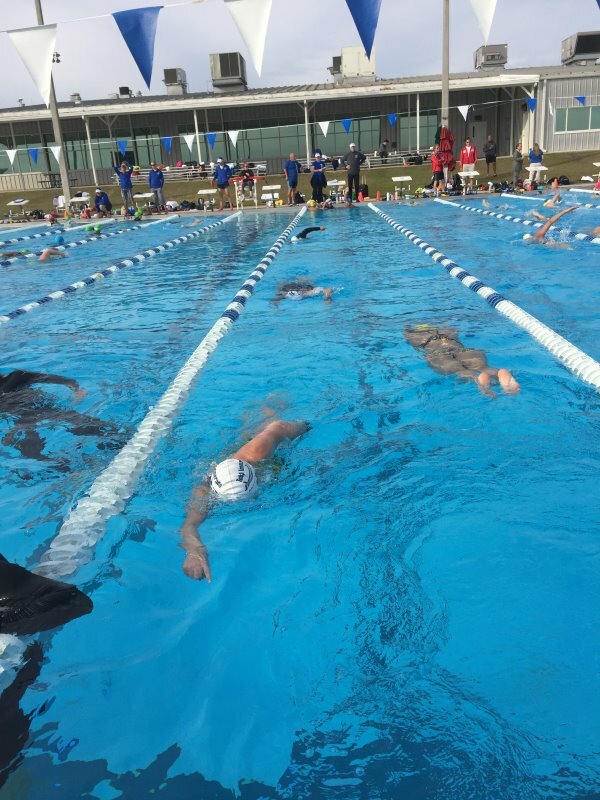 Each swimmer takes one side of the lane – it is convenient if there is a center line on the bottom of the pool to divide it visually – and stays on that side going up and down the lane. Beware if the other swimmer has a tendency to drift toward the center line and then possibly collide arms with you. If you have a lane to yourself and notice that people are coming in and sharing will be inevitable, it will be in your interest to stop at the wall, choose one of those swimmers to invite into your lane to share. If possible, choose the one you feel will be most safe and compatible with you in your lane. One you have more than two people in a lane every must switch to swimming in a loop, all swimming down on one side of the lane, and coming back on the other. Make sure you know which direction your lane is looping so you can slip in without disruption. It is also a good idea that you dangle your feet or stand in the water at the wall until every swimmer in that lane has come around and noticed that you are joining them. This way they are made aware that another body is going to fill the space with them. At the wall, before pushing off, look ahead to sense how much runway you have if you think you’ll need to pass the swimmer ahead. While swimming, before attempting to pass, glance forward to make sure the center of the lane is clear. And, make sure you’ve got enough space ahead so that you can pass in front of their head before they attempt to turn, so they will know you are passing – you don’t want them turning blindly and pushing off into you! If going in the same direction and you feel someone’s fingers brush your toes, this may be an accidental or deliberate signal that someone would like to pass you. Squeeze right, and swim as close as possible to the lane line, giving them room to pass in the middle of the lane. If you are swimming in opposite directions and in your peripheral vision you can see that a wide-recovery swing or a swimmer is coming too close to the center line, squeeze right to give more room. To increase safety more, pause in Skate Position just a brief moment to let their body and recovery arm slide past the point where a collision is possible, then begin your own recovery swing a resume your normal rhythm. Assuming a counter-clockwise (non-UK), if you sense a faster swimmer is coming up on your toes and cannot pass, then you are obliged to stop and let them make their turn at the wall first. Glide to the right corner of the wall/lane line intersection. Grab the wall and pull yourself quickly into the corner to get your body out of the way. Make as much room for turning in the middle and left side of the lane as possible. Try not to make them have to slow down as they approach their turn because good turns require full velocity. When approaching the wall, glance up to see that the turn zone on the wall is clear and then in the last 3 meters to the wall veer to the left size. Make your turn on the left side of the wall, not on the center line, so that your turn and push will take place on the side you will start swimming back down the lane. This reduces the potential for collision. I happen to push off more deeply so I am gliding forward at a depth lower than an incoming swimmer. If I have not noticed a swimmer coming up on my tail as I near the wall, I am safer from collision if I go deep, and then angle up toward the surface past the flags. You might be slower than others, and you might be faster, but you send the message to the others in your lane that you are a serious swimmer when you keep moving. You can squeeze over and let someone pass, or you may sprint around someone, but stay focused on doing your thing, being as kind and tolerant of others as is reasonable. But you and the other serious swimmers will send the message to those who might get in and just take up space chatting or loitering at the wall. And, if you have a regular pace or pattern, the other swimmers can get a sense of that and then negotiate the timing of their laps accordingly. But those who are sporadic and inconsistent in their progress in the lane will only make it much harder for everyone else to get into any sort of pattern around them. © 2017, Mediterra International, LLC. All rights reserved. Unauthorized use and/or duplication of this material without express and written permission from this site’s author and/or owner is strictly prohibited. Excerpts and links may be used, provided that full and clear credit is given to Mediterra International, LLC and Mediterraswim.com with appropriate and specific direction to the original content.